Both variations worked fine in our testing, so go with what works for you. This is a great tweak for web developers and designers who need to perform browser compatibility tests on as many different browsers as possible. Bookmarklets are a fairly popular way to add functionality to Safari that otherwise is impossible, allowing you to do things like “View Source” from Safari in iOS, adjust font sizes of web pages, and even run Firebug lite in iOS. This particular one has circled around the web recently but originates from jonabrams.com. I could imagine this being useful for webdevs worried about compliance, but I just don’t find Chrome to be useful enough to become my browser of choice for iPad. I use it on the desktop, but it will be a revision or two before Google gets the iOS version sufficiently speedy to make it worthwhile. Also, has anyone else noticed some of the assets are fit for the iPad 3 retina display yet? I start use chrome but nothing better than Safari, very slow to render web pages! 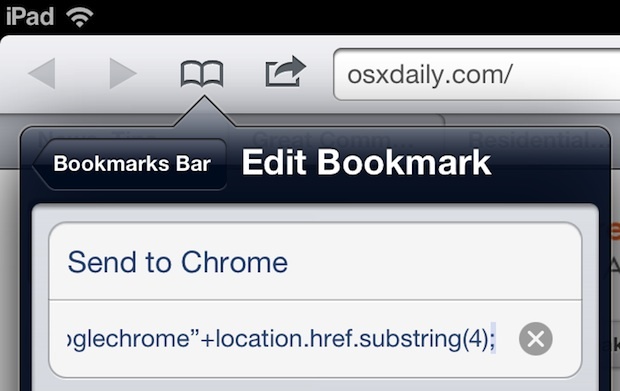 There’s a lot o work to do on iOS Chrome. Ive been finding chrome faster than safari. I wish there was a way to make it the default.